My story, like many, started many years ago. I was a busy salon owner, working very long stressful hours, a full social life, and truth be known, included a few lifestyle ‘choices’ that was a lot of the time, pushing the boundaries of my body! I also, was teaching in the hairdressing industry, which like the industry on a whole, was very demanding. Fast forward a few years and my spunky husband and I became pregnant with my beautiful daughter. It was during this time that I developed some health problems, all put down to, “oh, you’re a new mum” scenario. Truth be known, I had been experiencing some niggly health problems for years, but like many, just ignored them and pushed on through. I was good at displaying a ‘smokes and mirror’ façade! As time went on, more symptoms developed and I persisted in speaking to several doctors, many tests, and some complimentary modalities, but no one could give me any answers, several doctors were even quite dismissive to some of my symptoms. I began thinking, was this all in my head? But I knew, deep down, what I was feeling and the symptoms I was experiencing (there was a long list!) were not in my head and let me tell you, my head was feeling a wee bit ‘fuzzy’! I was increasingly, feeling very irritable, major digestive issues, chronic candida, bloated (looking pregnant most of the time!) skin irritations, amongst other ailments and just feeling constantly overwhelmed! By coincidence, I was fortunate enough to meet a lovely health coach, who gave me a supportive helping hand, sympathetic ear and encouraged me to seek a medical professional, who could really help me, which is what I did. She recommended a wonderful practitioner, who was qualified in several areas but very much had a holistic approach. He really listened to me and diagnosed me with what is commonly called, ‘leaky gut’ (intestinal permeability). This was quite a few years ago. 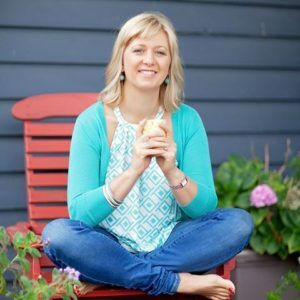 It was a long and at times very challenging journey for me, not only to heal and treat my digestive issues and the many other ailments I was experiencing, but with the help of my practitioner, we have been able to really dig deep into the layers of what was really going on in my body, mind and spirit. This has been truly life changing for me, I can’t even begin to tell you just how much. What I can say to you, is that I truly feel more ‘ME’ than I have ever felt. I still feel there is a some ‘fine tuning’ and I always believe we are constant working progress, but without this journey and support of my health coach and wonderful practitioner, I don’t think I would be sitting here feeling as amazing and vibrant as I do, now. One thing I can honestly say, is through my own health concerns and chatting too many women over the years, combined with my own research and studies, is that as women, we are always RUSHING! Rushing around doing everything, being all for everyone in our lives, juggling so many balls, often wearing this role as a badge of honour. But is all this rushing around creating the underlying causes of many of our health problems, be it digestive, hormonal, sleep, energy, weight, skin, mood issues ( and the list goes on!)? MMMMM, in my opinion, I think, YES!! How do I know this….because that was me!! All my experiences with my health and my 26 years of working with clients, many of which were women, in the hairdressing industry (yes, let’s face it, I’ve been coaching for years but under the disguise of a ‘hairdresser”) ignited my desire to study and become a health coach. I truly believe that stress, although not the only player, is a big player in our health, along with our lifestyle habits, what and how we eat. My aim is to help women unravel the integral role that we play in our own health. This in no ways means I will diagnose, nor will I prescribe or deny medication. I will leave this up to your qualified health professional. My intention for women, is to work alongside you and if required, your health professional, by guiding you, with holistic, yet practical goals, creating food and lifestyle changes to develop ‘balance’ and calm in their lives. I received my training and certification from the Institute for Integrative Nutrition, where I was trained in dietary theories, looking at how food can be one person’s medicine and another’s poison, along with studying a variety of practical lifestyle coaching methods. Drawing on this knowledge and my ongoing commitment to further research and study, I will help you create a completely personalized “roadmap to health” that suits your unique body, lifestyle, preferences, and goals.